We know - getting a new system is both really exciting and fairly daunting all at the same time. You have this shiny new system...with nothing in it. What do you do with this totally empty system?? Let's walk through the things you ought to learn & discuss before you start setting up your system and then help you set everything up! Who is this Springboard for? While it's initially sent to the first Admin level user created in the system, that doesn't mean only that person should take a look! (Unless you're a solo librarian...then it just makes sense, of course! ;) ) This guide is for anyone who is helping to initially set up the system. Others may or may not be Admin level users in the system, but they can still understand the options and help discuss / form the plan for how you'll use the system, so feel free to share the information! 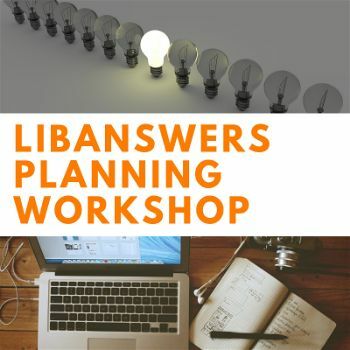 Join our Springy Training Team for the Planning your LibAnswers Site workshop, offered monthly. This session is for folks just getting started with a brand new LibAnswers site -- or attempting a total overhaul. We’ll discuss how the different parts of LibAnswers integrate, efficient setup, and planning for future growth. Visit the Springy training calendar to register for the next available session! While you're there, also check out our LibChat: System Setup & Answering Chats and Setting up LibAnswers Groups & FAQs sessions, as well! Or, if you're unable to make it to a live training session, check out the LibAnswers System Tour & Planning video anytime in our training video collection. Before you start adding user accounts for your colleagues, it can be helpful to get your system settings configured first. This will make sure that all of the settings are the way you want before users start adding content to the system. The most important of these is your Time Zone, as this affects the timestamps throughout the system. This will impact the timing of email notifications, among other things, so be sure to select the proper time zone for you system. This is where you can start giving your colleagues access to LibAnswers. 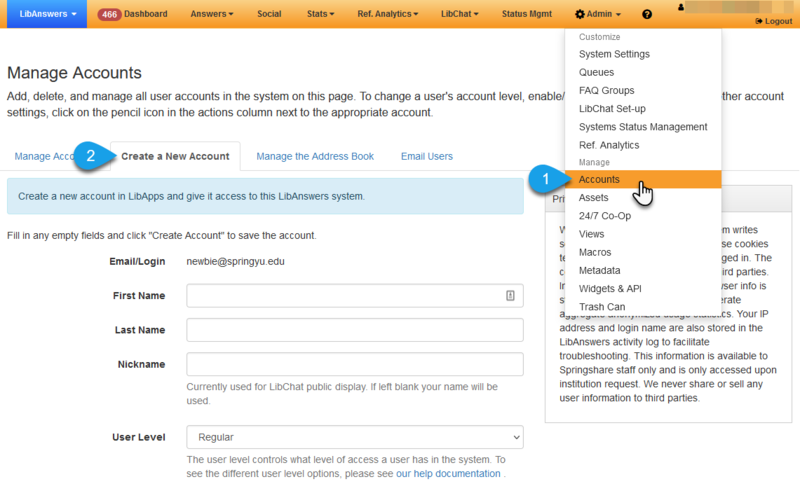 When you add an account, be sure to select the appropriate level of permissions for that user, based upon how you need them to use the system. For example, if you will have other folks helping you manage the system, you'll want to make sure they have admin-level access. Once you've given everyone access, encourage them to explore the system hands-on and start creating content. Don't forget to share our documentation, videos, and training calendar, too, in case they need any help! FAQs are public, searchable frequently asked questions that you want to share with your library community. And groups are the primary way of organizing these FAQs in LibAnswers. Each system has to have at least one FAQ group; however, you can add as many groups as you'd like. For example, you can add groups for different departments (reference, circulation, etc.) or services (tech support, borrowing policies, etc.). In addition to keeping your FAQs organized, each group also has its own set of customizable web pages. These allow your users to browse, search, and view your FAQs, with the web pages for your Default groups serving as the homepage for your LibAnswers system. When setting up your groups, you have the opportunity to customize the appearance of your public pages. That's because your groups serve as the public interface to your LibAnswers system. Your system's default group serves as the homepage for your entire LibAnswers system, but you can add as many groups as you'd like. Each group has its own friendly URL, pages, and look & feel options, allowing you to give them a completely customize web presence. Patrons will use your groups to search and browse your FAQs. That's why it's important to spend some time setting up the topics you want to use to organize your FAQs within each group. Topics can be used to browse each group's FAQs and to filter search results. Also be sure to set up the appropriate user access for each group. System Admins have full access to each group, but you will need to specify which regular users will be able to add and edit FAQs in the group. A ticket represents a conversation between you and your patrons - their question, your answer, and any other replies! Tickets can also contain internal notes - for example, a conversation between you and a colleague, or an internal note containing information that might be useful to others answering similar tickets. Each ticket is assigned to a queue, which is how tickets are organized in LibAnswers. For example, you could have one queue for general reference questions, another for circulation questions, and even another for tech help questions! When setting up your queues, one of the most important decisions you need to make is who should have access to the queue. System admins have full access to each queue, but you will need to specify which regular users will be able to manage tickets within the queue. If someone has not been given access to the queue, then they will not be able to view or reply to questions submitted to the queue. Next, you'll want to configure the different channels your queue can use to receive questions. This includes your queue's online question form, email address, SMS number, and social media accounts. When you connect a Facebook or Twitter account to your queue, you will also be able to send and manage Facebook messages and Twitter messages & mentions right from within LibAnswers. Lastly, you'll want to spend some time setting up the tags you want to use to organize your tickets. Tags can be used to search for tickets and filter your stats. This is also a good time to set up any macros you want to use, as well, when replying to tickets. LibChat is a full-featured chat-reference tool built directly into LibAnswers. With LibChat you can create dedicated chat departments monitored by multiple staff members, build and embed customizable chat widgets that can go just about anywhere, answer incoming chat, SMS and Facebook message in the same place, and more! The first step in setting up LibChat is creating your chat departments. When creating a department, you need to assign users to monitor chats within that department. You can select individual users, or you can assign a department to a queue. When you assign a department to a queue, any user with access to the queue will be able to monitor chats in that department. This is helpful if you want the same people answering tickets in your reference queue to also monitor chats in your reference department. Next, you'll need to create some LibChat widgets to embed in your website and anywhere else where you want patrons to chat with you. Just make sure that the widget is configured to be monitored by the appropriate chat department(s). Lastly, consider setting up some canned messages for your staff. These can be a real time saver, as they give you ready-made messages that you can use to quickly reply to frequently asked questions. The Reference Analytics module allows you to track all of the questions you're asked, regardless of the the user's location or the library service they're using. You can define the data you want to record, create multiple datasets (to track everything that's important to you), and gather valuable data about how questions are asked and answered throughout your library. You can input new transactions directly from a ticket in LibAnswers, after an interaction in LibChat, and directly from within the module. To get started with Reference Analytics, you'll need to configure your dataset(s). Each dataset is set up to gather a question and answer, but you can add up to 10 multiple-choice fields to gather additional information. For example, you could record the patron's status, the type of question asked, where the question was asked, and how long it took to answer it. Before you start recording transactions, it's important that you get these questions set up the way you want them. Changes made to the multiple-choice options after you've recorded transactions will be reflected in those transactions. The System Status Management Tool helps you manage status updates and convey important information about your library systems such as your online catalog, discovery service, subscription databases, library website... and any other system or service at your library. You can create system help widgets that can be embedded directly within a product to get your patrons' questions and feedback about it fed directly into LibAnswers. Along with using the systems status dashboard and feedback manager to help your patrons' keep track of the status of every library system and service; and to help you organize and manage feedback, ideas, and suggestions for your products. The first step in setting up the System Status Management Tool is to add products. A "product" can really be anything you want to manage: your library website, a database, the catalog, your computer lab or printers, etc. Each product gets its own widget, status page, and ticket tag. Once you've gotten your products set up, configure the System Status Management Tool's settings. If you have other users who will need to be able to update product statuses and create posts, this will give you the opportunity to give them access to the module. Lastly, determine where you want to embed your product widgets. Each widget is specific to each product: it gives users the ability to get point-of-need help with that product via your FAQs and related LibGuides. If they can't get the help they need, then they can submit a question via the widget. Tickets submitted via the widget will be tagged with the product's name, making it easy for you to identify these tickets in your queue. If you have the ability to embed these widgets directly into the product's webpage, it can be a very helpful resource for you and your patrons. For example, let's say your library's website is springylib.org and your LibAnswers website is springylib.libanswers.com. If you'd like your LibAnswers site to also end with springylib.org, you could change it to something like libanswers.springylib.org. Whether or not you decide to customize your domain name, we recommended that you configure your site to always load over HTTPS. This will ensure that your patrons are always accessing your site and submitting forms over a secure, encrypted connection. If your site uses a libanswers.com domain name, you can begin viewing your site over HTTPS right away. Your LibApps admin can configure your site to always load over HTTPS (strongly recommended). If your site uses a custom domain name, then you first need to work with your IT staff to update your DNS. We will then automatically install a free Let's Encrypt SSL certificate for your site, at which point your domain name change will take effect. Your LibApps admin can then configure your site to always load over HTTPS (strongly recommended). Before you go, consider reviewing the following checklist to make sure you have everything set up and ready for action. If you missed something, no worries! Check out the sections above for help tying up any loose ends. Have you configured your system settings, such as your system name and time zone? Does everyone who needs a user account have one? Have you customized the basic look & feel for your system the way you want, such as your banner image, header, and footer? Did you want to customize your site's domain name? Is your site set to always load over a secure, encrypted HTTPS connection? Have you created any additional FAQ groups that you may need? Has each user been given access to the group(s) they need? Have you created and published your FAQs? Have you customized your ticket queue, including your question form, email address, and notifications? Has each user been given access to the queue(s) they need? Did you want to monitor your social media accounts using LibAnswers? Have you created one or more LibChat departments and chat widgets? Has each user been given access to the department(s) they need? Have you identified where you want to embed your chat widgets? Have you set up your Reference Analytics datasets? Did you want to set your system settings to prompt users to add tickets and chats to your datasets? Have you set up your Systems Status Management tool settings and products? Have you given access to all Regular users who need it? Have you identified where you want to embed your product widgets?